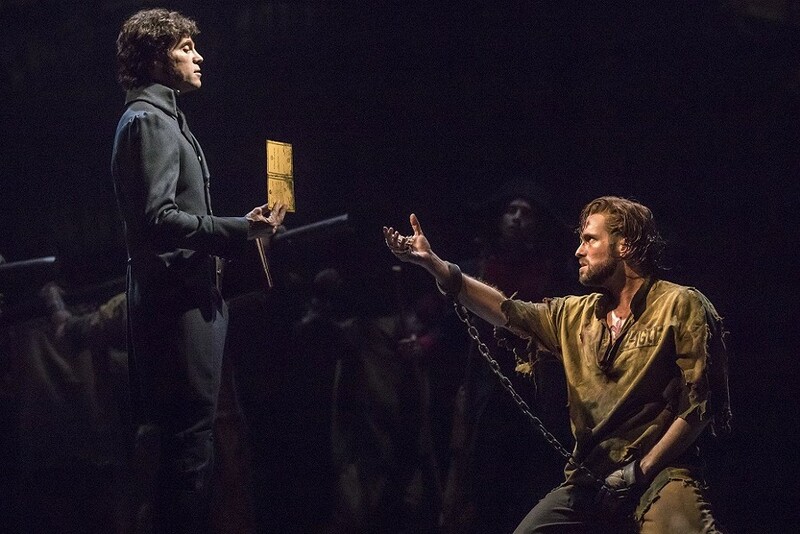 PHOTO BY MATTHEW MURPHY Josh Davis as ‘Inspector Javert’ and Nick Cartell as ‘Jean Valjean’ in the new national tour of "Les Misérables." When a stage musical has been recently adapted as a feature film, it's a challenge to make the story come alive on stage in quite the same way. Unless, of course, that story is "Les Misérables," and the cast is inimitable. Such is the case with Rochester Broadway Theatre League's current season special, the national tour of "Les Misérables," fresh off a two-and-a-half year Broadway revival. The story is based on the 1862 novel of the same name by Victor Hugo and follows the plight of Jean Valjean, a Frenchman sentenced to 19 years of hard labor for stealing bread to save his starving nephew. When he is released, Valjean breaks parole and leads a life that redeems his lost years -- but Javert, a French officer familiar with his case, continues to hunt him. "Les Misérables" could best be considered an operetta, as most of the dialogue is performed as musical numbers. While this method has a potential to grow old, here it works. The lyrics are by turns hilarious ("Master of the House") and heartbreaking ("Empty Chairs at Empty Tables"). "Les Misérables" is known for its incredible score, and the orchestra and singers do not disappoint during this production. Every lead performer is precise, nailing the well-known characters they are portraying. Throughout the nearly three hour show (including one intermission), Nick Cartell (Jean Valjean) does not miss a step, transitioning from high to low pitches and young to old movement. Cartell is a supremely versatile actor, and that's apparent in this production. Paige Smallwood (Eponine) plays up the role's more shrill potential to a somewhat extreme degree, but brings the audience to tears during "On My Own," which kicks off Act Two. Other standouts include J. Anthony Crane (Thenardier) and Allison Guinn (Madame Thenardier), who elicited the most laughs from the crowd; and the tiniest revolutionary, Parker Dzuba (Gavroche), who is a captivating presence onstage. Joshua Grosso (Marius) and Jillian Butler (Cosette) play ideal ingénues, delicately portrayed yet integral to the chemistry of the ensemble. And Stevie Nicks-looking wig aside, Matt Shingledecker (Enjolras) is inspiring as leader of the students. Some of the most impressive work, aside from the cast, comes from the tech crew. Using art from Victor Hugo's own works, set and image designer Matt Kinley has created a thoroughly authentic world reminiscent of a renaissance era painting. Fifty-Nine Productions complements Kinley's work with a living, breathing projection backdrop for so many of the scenes in the show (the most impressive sequence being the sewer where Valjean and Marius end up). Because it is a season special and not a part of the official RBTL season, "Les Misérables" will run only through Saturday, November 24 (both Friday and Saturday offer two show times). And for those who are basing their knowledge of the musical on the 2012 film or have never seen the show onstage -- it's time to make like Valjean and get this bread. Theater Theater Theater review Rochester Broadway Theatre League "Les Misérables"